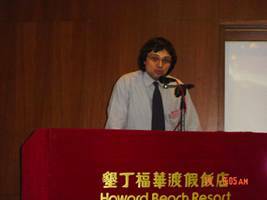 Welcome address by Professor Dimitris P. Iracleous in WSEAS Taiwan Conferences in the morning of Jan. 14, 2004. WSEAS Taiwan Conferences' VIP Prof. J.-H. Tsai's address in the morning of Jan 14, 2004. He is from NSC and NCHC, Taiwan. 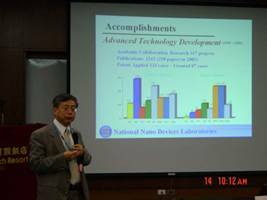 Keynote Speaker Professor S.-T. Peng's talk: National System-on-a-Chip (SOC) Program in Taiwan. 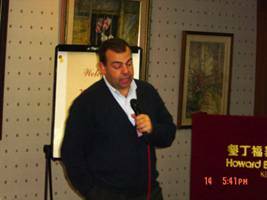 This is the first keynote speak in the morning of Jan. 14, 2004. A view of the conference room. From the left to right: Prof. Dr. B.-T. Dai (Keynote speaker from NDL), Prof. Dr. J.-H. Tsai (NSC and NCHC represent), Prof. Dr. Yiming Li (Chairman from NDL and NCTU, Taiwan), and Prof. Dr. Dimitris P. Iracleous (WSEAS represent from Greece). 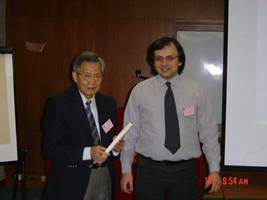 Professor Dr. Dimitris P. Iracleous gives the keynote spekaer Prof. S.-T. Peng with WSEAS published book as a gift, after his talk. 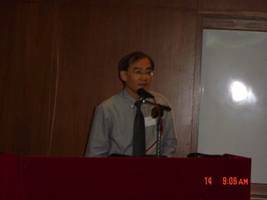 Keynote speaker Prof. Dr. B.-T. Dai gives his talk "Education Support and Technology Development on Semiconductor and Nanotechnology in NDL" in the morning of Jan 14, 2004. 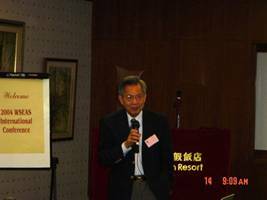 Prof. Dai is currently the vice-president of national nano device laboratories at Hsinchu, Taiwan. 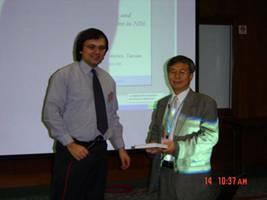 Professor Dr. Dimitris P. Iracleous gives the keynote spekaer Prof. Dr. B.-T. Dai with WSEAS published book as a gift, after his talk. 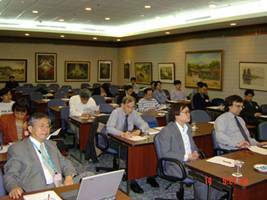 Professor Dr. C.-S. Lai from Chang Gung University, Taiwan is the chair of session A: Nano Fabrication in the morning of Jan. 14, 2004. 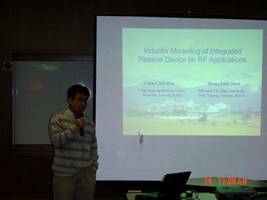 Professor Dr. Meng-lieh Sheu from Department of Electrical Engineering of National Chi Nan University, Nan-Toul, Taiwan presented his paper in the session B: Nano Device (I): Physics in the morning of Jan. 14, 2004. 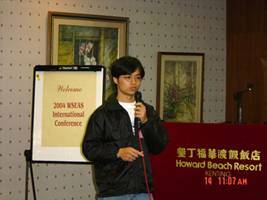 Dr. J.-T. Sheu from Taiwan presented his paper in the session A: Nano Fabrication of WSEAS Taiwan Conferences in Kenting. 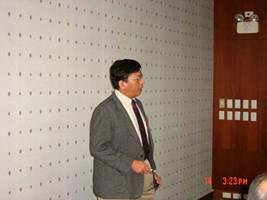 Professor Dr. Jam-Wem Lee from national nano device laboratories, Taiwan is the special session Chair. 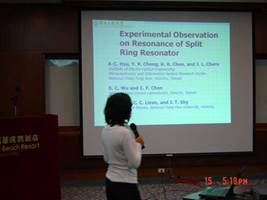 This Session A2: Nano-Scaled Insulator Films for Nanoelectronics (I) is in the afternoon of Jan. 14, 2004. 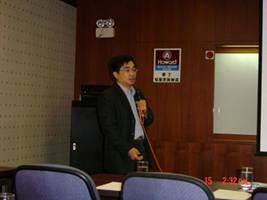 Professor Dr. Mao-kuen Kuo from National Taiwan Univeristy, Taipei, Taiwan presented his paper in the special session Session B2: Computational Nanoelectronics (I) in the afternoon of Jan. 14, 2004. 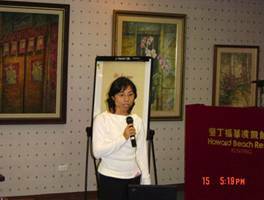 This session Chair is Professor Dr. Jyun-Hwei Tsai. 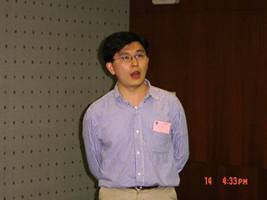 Professor Angus Wu from Hong Kong is the chair of the session B3: Solid Sate Electronics & Circuit (I). 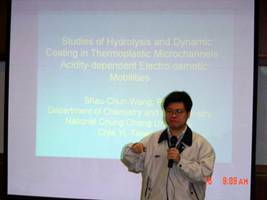 He also presented his paper in the session in the late afternoon of Jan. 14, 2004. Dr. S.-M. Yu from Department of Computer and Information Science, National Chiao Tung University, Hsinchu, Taiwan presented his paper in the session B3: Solid Sate Electronics & Circuit (I) in the late afternoon of Jan. 14, 2004. Professor Dr. Jose Manuel Ribeiro da Fonseca from Center for Intelligent Robotics, UNINOVA, Quinta da Torre, Portugal presented his paper in the session A3: Optical Technology (I) in the late afternoon of Jan. 14, 2004. 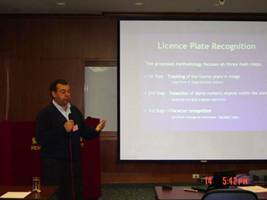 Professor Dr. Jose Manuel Ribeiro da Fonseca from Center for Intelligent Robotics, UNINOVA, Quinta da Torre, Portugal presented his paper in the session A3: Optical Technology (I) in the late afternoon of Jan. 14, 2004. 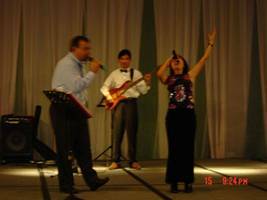 The 2nd photo for Professor Dr. Jose Manuel Ribeiro da Fonseca. 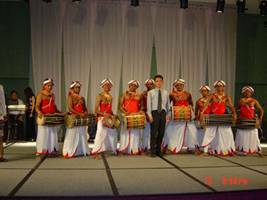 Professor Dr. Akeed Ahmed Pavel and his wife were from EAST WEST UNIVERSITY 43,45-46 & 49, Mohakhali C/A Dhaka-1212 Bangladesh. 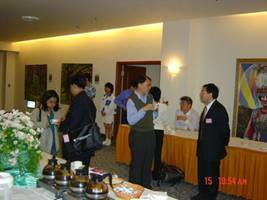 Prof. Dr. Dimitris Iracleous (Greece) hosted them in the front desk of WSEAS Taiwan Conference in the morning of Jan. 15, 2004. 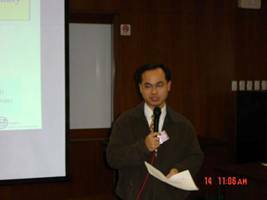 Dr. C.-S. Tang from Department of Electrophysics, National Chiao Tung University, Hsinchu, Taiwan presented his paper in the session A4: Solid Sate Electronics & Circuit (II) in the morning of Jan. 15, 2004. 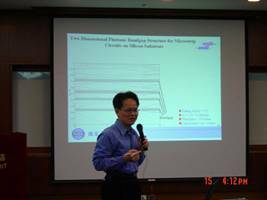 Manager Dr. Li Er Ping from Institute of High Performance Computing, Singapore presented his paper in the session B4: Computational Nanoelectronics (II) in the morning of Jan. 15, 2004. This is a special session hosted by Chair Dr. S. C. Lo. 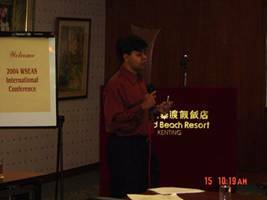 Professor Dr. Akeed Ahmed Pavel from EAST WEST UNIVERSITY, Bangladesh presented his paper in the session A4: Solid State Electronics & Circuit (II) in the morning of Jan. 15, 2004. Professor Dr. S.-C. 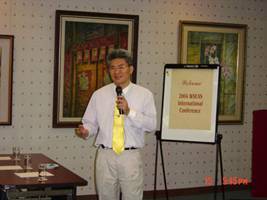 Lo presented his paper in the session B4 in the morning of Jan. 15, 2004. Session B4 is Computational Nanoelectronics (II). 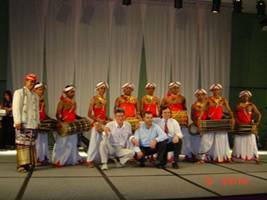 This special session was hosted by Prof. Lo. 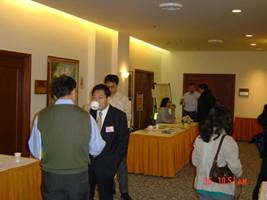 A view of the coffee break in the morning of Jan. 15, 2004. A view of the coffee break in the morning of Jan. 15, 2004. The 2nd photo for the coffee break. 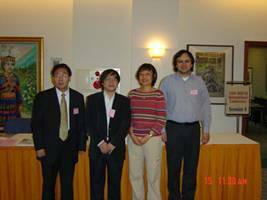 From left to right: Manager Dr. Li from Singapore, Prof. Yiming Li, Chairman in Taiwan, Researcher Dr. Chen from Tokyo, Japan, and Prof. Dimitris P. Iracleous, represent of WSEAS in Greece. Professor Dr. Laurent Montes from IMEP, GRENOBLE, FRANCE presented his paper in Session B5: Nano-Scaled Insulator Films for Nanoelectronics (II) in the morning of Jan. 15, 2004. This is a special session by Dr. Jam-Wem Lee. 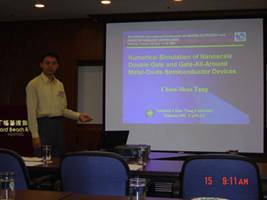 Dr. T.-L. Lee from NCTU presented his paper in Session B5: Nano-Scaled Insulator Films for Nanoelectronics (II) in the morning of Jan. 15, 2004. 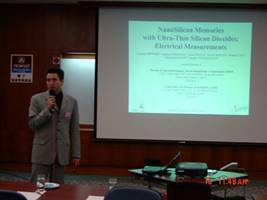 Professor Dr. Ker from NCTU presented his paper in Session B6: Electrostatic Discharge (ESD) Protection for Nanoelectronics in the afternoon of Jan. 15, 2004. This is a special session hosted by Prof. Ming-Dou Ker. 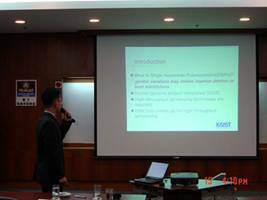 Dr. Jae Yang Song from KAIST, Korea presented his paper in the session B7: Computational Science & Biology in the afternoon of Jan. 15, 2004. 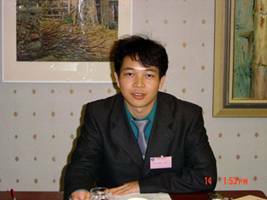 The session Chairman is Prof. Dr. Yiming Li. 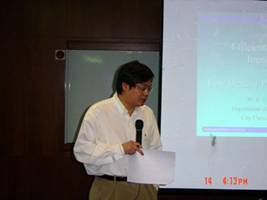 Prof. Dr. Min-Hang Weng from NDL, Taiwan presented his paper in Session A7: Researches on Meta-material in the late afternoon of Jan. 15, 2004. This is a special session hosted by Chairman Prof. Dr. Shich-Chuan Wu. 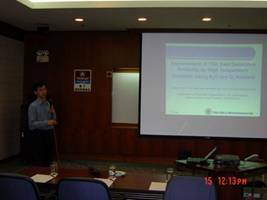 Prof. Dr. A-Chuan Hsu from NCTU, Taiwan presented her paper in Session A7: Researches on Meta-material in the late afternoon of Jan. 15, 2004. 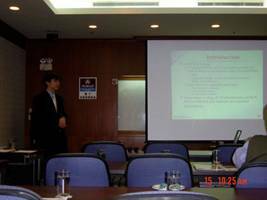 Prof. Dr. A-Chuan Hsu from NCTU, Taiwan presented her paper in Session A7: Researches on Meta-material in the late afternoon of Jan. 15, 2004. The 2nd photo for Dr. Hsu. 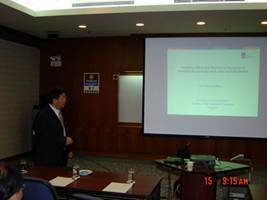 Prof. Dr. S.-C. Wu from NDL, Taiwan presented his paper in Session A7: Researches on Meta-material in the late afternoon of Jan. 15, 2004. 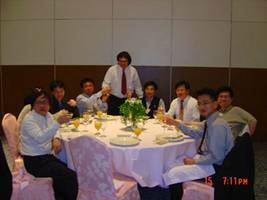 Banquet in the evening of Jan. 15, 2004. The 1st photo. 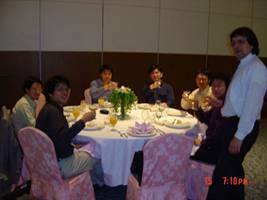 Banquet in the evening of Jan. 15, 2004. The 2nd photo. 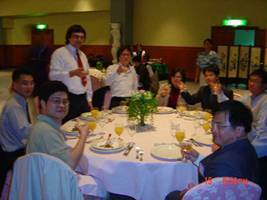 Banquet in the evening of Jan. 15, 2004. The 3rd photo. 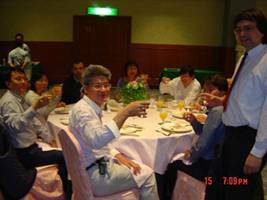 Banquet in the evening of Jan. 15, 2004. The 4th photo. 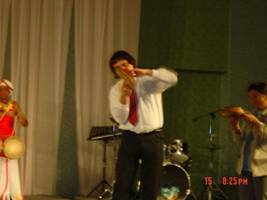 Banquet in the evening of Jan. 15, 2004. The 5th photo. 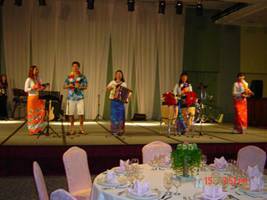 Banquet in the evening of Jan. 15, 2004. The 6th photo. Banquet in the evening of Jan. 15, 2004. The 7th photo. Banquet in the evening of Jan. 15, 2004. The 8th photo. Banquet in the evening of Jan. 15, 2004. The 9th photo. Banquet in the evening of Jan. 15, 2004. The 10th photo. Banquet in the evening of Jan. 15, 2004. The 11th photo. Banquet in the evening of Jan. 15, 2004. The 12th photo. 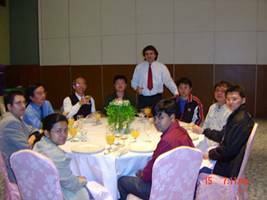 Banquet in the evening of Jan. 15, 2004. The 13th photo. 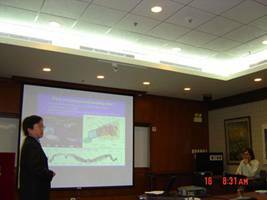 Professor Dr. Shau-Chun Wang from Department of Chemistry and Biochemistry, National Chung Cheng University, Chia-Yi, TAIWAN presented his paper in Session A8: Nano Device (II): NEMS Applications in the morning of Jan. 16, 2004.